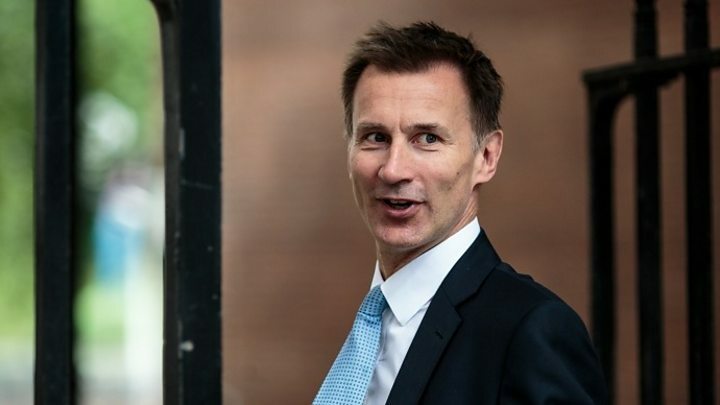 Europe should impose further sanctions on Russia in response to its "malign" behaviour around the world, Jeremy Hunt has said on his first visit to the US as foreign secretary. He called on the EU to replicate Washington's "comprehensive" response to the Salisbury nerve agent attack. The US is set to ban Russian exports of security-sensitive goods following the poisoning of Sergei and Yulia Skripal. Europe must engage with Russia but be "blunt" about its actions, he said. Labour warned against new sanctions which it said would "further ratchet up international tensions". And Russian foreign minister Sergei Lavrov accused the UK of arrogance in trying to "dictate" the EU's policy towards Russia when it was on the verge of leaving the organisation. 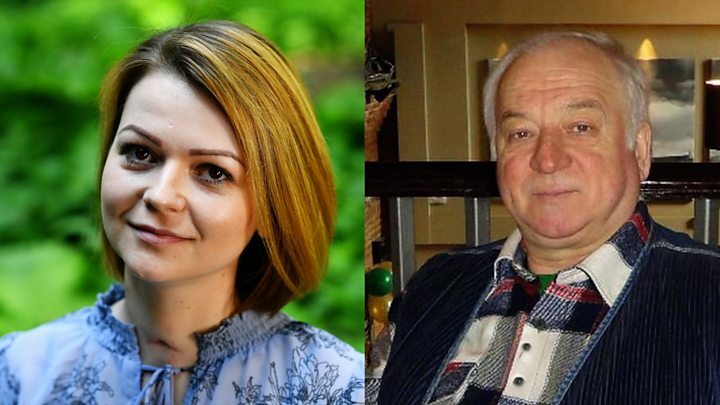 The Skripals were poisoned in Salisbury, Wiltshire, in March. The British government has accused Russia of being behind the attack, but Moscow denies involvement. In June, two people in nearby Amesbury fell ill after being exposed to the same nerve agent, Novichok. One of them - Dawn Sturgess, 44 - later died. In a speech in Washington, Mr Hunt said Moscow must be aware that there is a "serious price" to be paid for repeated violations of the established rules of international conduct. He cited "foreign attempts" to manipulate elections as one of the reasons behind the decline in confidence in Western democratic systems. But he also said governments in Europe must do more to "get their houses in order" by addressing the causes of economic and social resentment associated with the growth of populism, such as the squeeze on living standards and concerns over immigration. Despite Mr Hunt's comments, BBC diplomatic correspondent James Robbins said there was "no appetite" among EU member states for further economic sanctions against Moscow, with some countries "suspicious" of action taken so far. During a three-day trip to the US, Mr Hunt - who succeeded Boris Johnson in July - will meet his counterpart, Secretary of State Mike Pompeo, as well as addressing the United Nations Security Council about the international fight against the Islamic State group and other Islamist terror groups. The visit comes as the US is set to ratchet up the pressure on Moscow over the poisoning of former Russian agent Mr Skripal and his daughter in the Wiltshire city in March. The US State Department is expected to confirm its intention to proceed with a ban on defence exports and certain government financial assistance in response to the attack, which it has blamed on Moscow. US officials are also expected to warn that further sanctions - including wider curbs on exports and US bank credit to the Russian government - could be imposed after three months without assurances that Russia is no longer using chemical and biological weapons and is complying with inspection and verification procedures. The UK said it is highly likely that the Russian government, which has denied all involvement, was to blame for the attacks - which prompted a wave of expulsions of Russian diplomats from the UK and across Europe. Mr Hunt said the Salisbury attack was part of a pattern of behaviour from Russia, including the annexation of Crimea and its support for the Assad regime in Syria, which made the world "more dangerous". The US president, Donald Trump, was asked in an interview with Reuters whether he would consider lifting sanctions on Russia. "I'm not considering it at all, no," he said. "I would consider it if they do something that would be good for us. But I wouldn't consider it without that." USA and Russia: What are sanctions? Mr Hunt called on the EU to "ensure its sanctions against Russia are comprehensive and we truly stand shoulder to shoulder with the US". "That means calling out and responding to transgressions with one voice whenever they occur, from the streets of Salisbury to the fate of Crimea," he said. "Those who do not share our values need to know that there will always be a serious price to pay if red lines are crossed - whether territorial incursions, the use of banned weapons or, increasingly, cyber-attacks". The Foreign Office said Mr Hunt wanted to ensure existing sanctions on associates of President Putin and state-backed entities were having their intended effect and to galvanise efforts to extend them where needed. But Labour's Barry Gardiner said the UK and its allies should be trying to "normalise" relations with Russia as Moscow's co-operation was needed to help resolve the conflict in Syria and deal with Iran. "I think imposing new sanctions on Russia would further ratchet up international tensions," he told BBC Radio 4's Today. "I don't think it's the right way to go." In his speech at the US Institute of Peace, Mr Hunt warned of multiple economic and security threats to the international order and said the once "rock-solid" transatlantic alliance will be undermined if opponents are "in any doubt about our red lines". Arguments over the funding of Nato and global trade have soured relations between the US and Europe since Donald Trump's election in 2016. While accepting arguments of Russia's potential culpability for the Salisbury attacks, Mr Trump has nevertheless pressed for better relations with President Putin and cast doubt on evidence of Russian interference in the 2016 US presidential election.